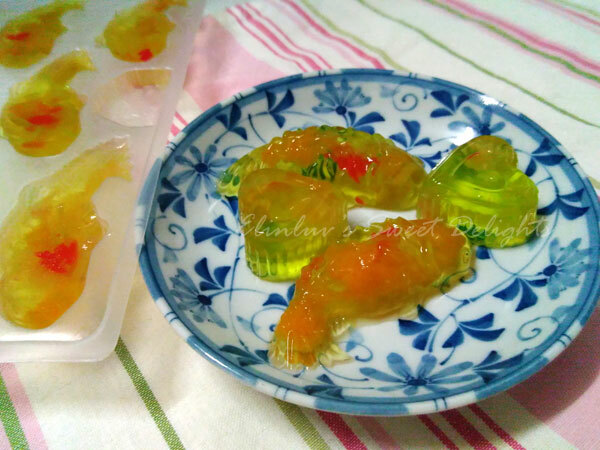 A simple dessert for the weekend :) A packet of konyaku jelly powder ( honeydew flavor ) and some mixed fruits...and tada, you have a tray of 'koi' shaped konyaku jelly for after dinner treat :) Hubby made them and I just sit back and relax. He has the whole kitchen to himself to make these delectable dessert. Slightly springy in texture and the mixed fruits was a great accompaniment for the konyaku jelly. Long time didn't make these. Love the springy jelly.